Balnaird House is one of the most splendid estates in the Scottish Highlands, the home of the ancient and venerable Aird family – and of a dark secret. When American executive Conrad Tucker discovered a photo of Laura Aird, the family's youngest daughter, in a magazine, his past suddenly returned to haunt him. Could it be that Laura is the fruit of his affair with the attractive Virginia Aird? Vowing to learn the truth, his investigations also led him to the Balmerinos, long-standing friends and neighbours of the Aird family. 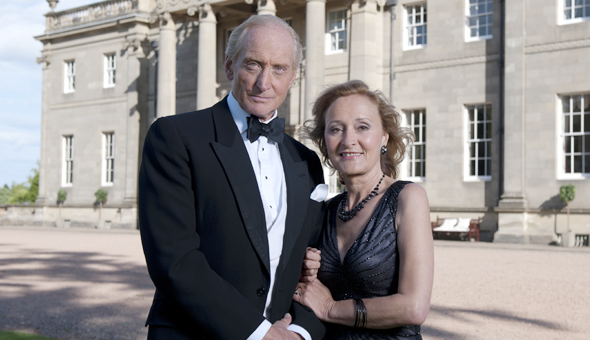 While Laura met and fell in love with the attractive Guy, during her Oxford studies, Archie and Isobel Balmerino, pleased with the successful renovation of their estate and the long-awaited return of their widely-travelled son Hamish, were planning to give a traditional September Ball. Meanwhile, Laura and Guy celebrated the engagement of her brother Henry and his fiancé, Emily. Little did they know that these were the last hours they would spend together before fate dealt them a very cruel blow. With Laura's lover Guy now dead in a terrible accident, she withdrew totally from society. Like everyone else, Hamish Balmerino also showed great concern towards the grieving young woman. Yet not even the prospect of the Bamerinos' upcoming September Ball could cheer her up. Deeply disappointed over his father's decision to make Noel Keeling, his sister Alexa's spouse, head of the family business. Henry joined Alexa's catering company instead. Both brother and sister had no idea that Noel had long been cheating on Alexa with her best friend Lucilla Balmerino. The affair nearly came out in the open when Lucilla lost a precious necklace at one of her rendezvous. Laura went on to become the successful publishing executive she is, returning from the USA and moving to London. When her grandmother Violet died, she left her share of the Aird family company to the completely unknown Olivia Thorpe. Edmund feared this could enable his ex-son-in-law, Noel, still the CEO, to gain majority control. So Edmund visited Olivia, who turned out to be his daughter from an affair with Pandora Balmerino during his marriage, the secret kept from everyone by Violet to avoid a scandal. He then introduced Olivia to her 'new' family. Noel meanwhile was using his charm to gain Olivia on his side, lying to her, determined to damage the Airds irreparably. His pregnant lover, Lucilla, had left him, returning to her parents' home in Scotland where she asked her best friend Alexa, Noel's ex-wife, to be present at the birth and the godmother of her son. Lucilla died in childbirth. The Balmerinos and Alexa now look after little Tom. Noel continued to deny paternity, Isobel and Archie were completely overwhelmed looking after their little grandson. Constantly reminded by Tom of Lucilla's loss, Archie nonetheless turned down Alexa's offer to adopt the boy. Now, in a shocking twist, it transpires Edmund Aird had sold the family estate Balnaird to the company during a financial crisis years ago. He fears Noel, should he gain the majority vote at the next shareholders' meeting, could get his hands on their wonderful home. Edmund is hoping Olivia will vote for the Airds, but does not know she was seriously in love with Noel, who has used every trick in the book to gain her support. Edmund has persuaded his son Henry, who enjoyed a good reputation until Noel forced him out of the company, to stand as an opposition candidate to him.